PSC has called for Government to seriously consider reducing the fuel tax in light of falling gold and rice prices. fuel in light of the current performance of the economy. According to the Private Sector Commission (PSC), over the last year the world market prices for Brent Crude Oil fell from a high of US$114 per barrel to a low on November 13, 2014 of $74 per barrel. 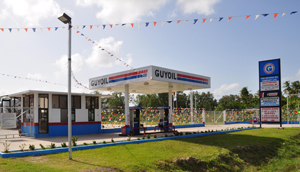 PSC said it sees the lower world market prices as having a positive impact on business but is disappointed at the pace at which the prices are lowered at the pumps in Guyana with much benefit not being garnered by consumers locally as yet. The PSC made it clear that while it understands this position, it still believes the Finance Minister can give due consideration to other factors when this adjustment is being done. This is to ensure that some of the savings seen worldwide will be passed on to the consumers in Guyana, especially since gold and rice prices have fallen dramatically and the performance of the economy has dampened in the last year. Earlier this month, the Finance Ministry said it has hiked the gasoline tax from 20 to 40 percent and diesel tax from 15 to 35 percent.